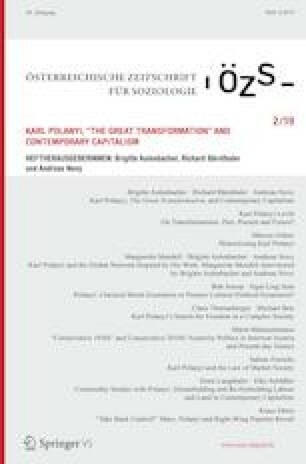 In this article, which originated from the keynote address to the conference “Karl Polanyi and the Transformation of the Contemporary World System” in Budapest in 2004, Kari Polanyi Levitt provides a vivid account of her father’s life and work. She shows how Karl Polanyi’s prediction of the fateful consequences of unleashing the destructive power of unregulated market capitalism has assumed new urgency and relevance in times of globalization and financialization, which manifest similarities with earlier penetrations of capitalism into the developing world. We have arrived at a critical moment in history. To gain perspective on possible futures we need to lengthen parameters of inquiry to embrace the history of European hegemony and the evolution of capitalism from its beginnings in mercantilist conquest. Thus, we must turn to the concepts that underlie the narrative of The Great Transformation—the fictitious commodities, the disembedded economy and the double movement—to make sense of past and present transformations and shape them in the future. This chapter was the keynote address, entitled “The Transformation of the World System: Some Insights from the Work of Karl Polanyi,” to the conference “Karl Polanyi and the Transformation of the Contemporary World System,” Budapest, Hungary, November 5–6, 2004. It was originally published in: Kari Polanyi Levitt. (2013). From the Great Transformation to the Great Financialization: On Karl Polanyi and Other Essays. Halifax/Winnipeg: Fernwood Publishing. The editors thank the publisher for the right of republication. Über Transformationen: vergangene, gegenwärtige und zukünftige? In diesem Artikel, der aus der Grundsatzrede der Konferenz „Karl Polanyi und die Transformation des zeitgenössischen Weltsystems“ in Budapest im Jahr 2004 hervorgegangen ist, berichtet Kari Polanyi Levitt auf anschauliche Weise über das Leben und Werk ihres Vaters. Sie zeigt, wie Karl Polanyis Prognose der verhängnisvollen Konsequenzen einer Entfesselung der zerstörerischen Macht des unregulierten Marktkapitalismus eine neue Dringlichkeit und Relevanz in Zeiten der Globalisierung und Finanzialisierung – welche Ähnlichkeiten mit dem früheren Eindringen des Kapitalismus in Entwicklungsländer zeigen – angenommen hat. Wir sind an einem kritischen Moment in der Geschichte angelangt. Um eine Perspektive auf mögliche Zukunftsformen zu erlangen, müssen wir die Untersuchungsparameter ausweiten um die Geschichte der europäischen Hegemonie und die Entwicklung des Kapitalismus von den Anfängen der merkantilistischen Eroberung aus zu begreifen. Demnach müssen wir uns den Konzepten zuwenden, die der Erzählung der The Great Transformation zugrunde liegen – den fiktiven Waren, der ausgebetteten Wirtschaft und der Doppelbewegung –, um die Transformationen der Vergangenheit und Gegenwart zu verstehen und sie in der Zukunft gestalten zu können.